It might seem bizarre, but this map of sidewalk snow plowing service (which I found inside a publication called City Routes put out by Toronto’s Transportation Services available online here) speaks volumes about the different urban forms across the City of Toronto. The zone defined by the inner red line contains “areas where vast majority of sidewalks cannot be ploughed”. The reasons given are that “sidewalk snowploughs are not able to operate effectively due to sidewalk width and a lack of boulevard space for snow storage”. No doubt on-street parking also plays a role, but the policy is also a legacy from the pre-amalgamation City of Toronto which to a large degree fell within the two reddish lines on the map, and which relied on residents and businesses to clear the sidewalk in front of their own premises. 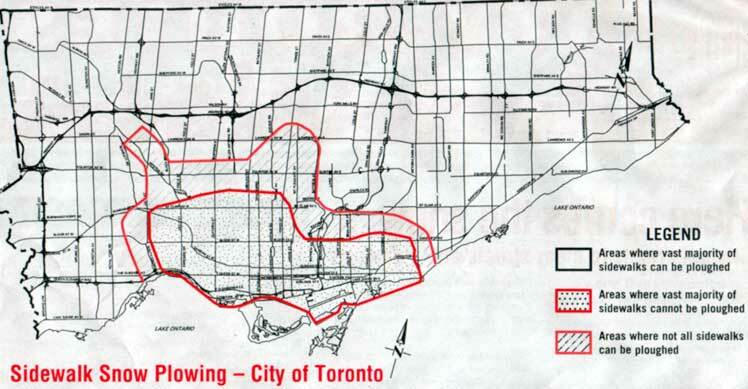 However, using the old boundary of the pre-amalgamation City of Toronto as a means of defining the limits of a particular “urbanism” (shall we call that an amalgam of urban form and urban culture?) is not necessarily accurate, as some of the outlying areas began to be built at lower densities even while sticking to the grid system common throughout the older city (the same can be said of Vancouver, where looking at a map shows the City proper almost entirely gridded, a fact that hides the reality that much of the southern and eastern portions are essentially gridded lower-density suburbs). So, I propose that this map of sidewalk snow ploughing service is actually a good measure of defining the older, traditional residential core of Toronto, an issue that can raise hackles of nostalgia when defined by other measures. The smaller sidewalks and lack of boulevards is highly suggestive of the more urban character of the residential streets in this zone, in particular, sidewalks being directly adjacent to the roadways and in most cases, on-street parking. This zone is also the one with the best pedestrian and transit connectivity. I haven’t checked, but I think you will also find that almost the entirety of the defined area was developed before about 1930 and much of it before the First World War, primarily as streetcar suburbs. The street names are hard to read so I’ll describe the boundaries – the west boundary is Jane Street – Bloor West Village is one of the last neighbourhoods to stick to the older street tradition. To the north (west of Yonge) the boundary floats north of St. Clair, including many of the neighbourhoods a walking distance from St. Clair. To the east of Yonge, the north boundary swings down close to the Danforth, then runs east to about Victoria Park to include the eastern neighbourhoods of the old City. 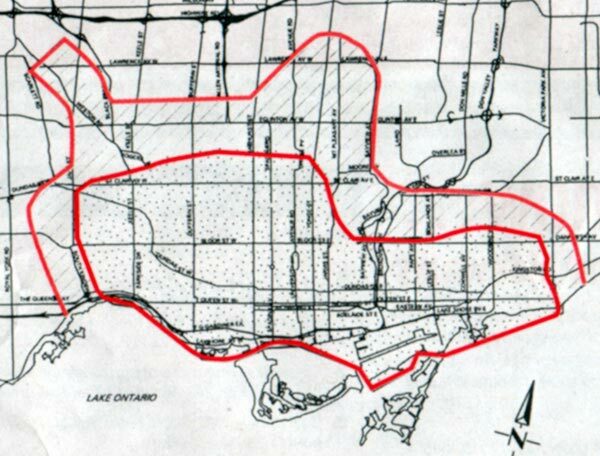 Of course, this line closely follows the pre-amalgamation boundary of the City of Toronto in many ways, with the northern “stub” removed, but in some ways this map bypasses the hard feelings associated with the whole amalgamation extravaganza to get right down to a question of urban form and lifestyle.